I drove 6 1/2 hours Saturday to Hattiesburg, Ms., where I will be staying at the Quality Inn Motel for the week end. I am preaching this week end for my good friend Pastor Daniel Purvis who pastors the Lighthouse Baptist Church of Sumrall, Ms. He has been the pastor of this church for 9 years. He was a regular attender to the NATIONAL SOUL WINNING CLINIC hosted by the Longview Baptist Temple of Longview, Texas. This was a great week end for this dear church. They are loaded with personal soul winners. Going into tonight’s service there have been 50 professions and 17 baptisms this week end. One of those making a profession of faith is Randal Bennett Jr.’s niece Christian Whitehead. 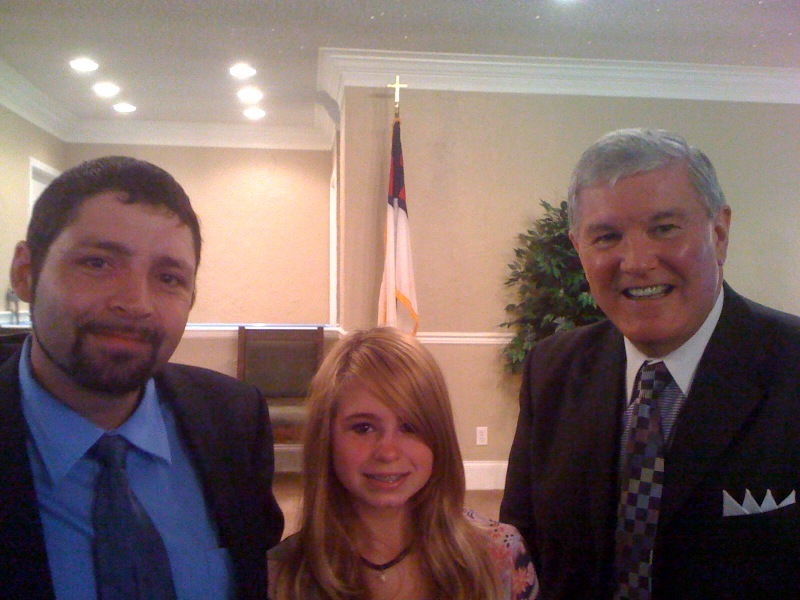 This 12 year old young lady was sweetly saved this morning. Randal was thrilled and it was good to see them hugging and weeping at the altar and rejoicing about Christian becoming a Christian. Gotta love serving the Lord!!! !